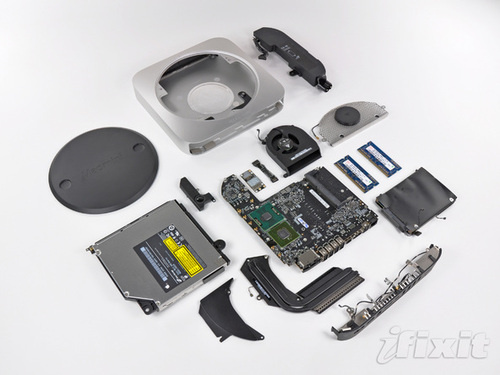 Our friends at iFixit have taken the new Mac Mini apart to show us it’s insides. From the looks of it, it was a pretty easy break down, with not too many parts inside. And, it looks just as good inside as i does out – in true Apple fashion. * Departing from previous generations, the Mini’s unibody top enclosure is machined from a single block of aluminum. * With a simple counter-clockwise twist, we were able to gain access into the Mini’s internals. Gone are the days of the putty knife. You will be missed, old friend! * Removing the RAM is very simple this time around, requiring only the simple prying of two clips. * The fan doesn’t have too much work to do, since the new Mac Mini is the most energy-efficient desktop, running on less than 10 watts at idle! * In keeping with its space saving design, the fins directing air toward the vent hole are slanted to allow for better fan placement. * The new Mini’s power supply churns out a minuscule 7 Amps at 12V. Compare that to the 25.8 Amps at 12V cranked out by the iMac Intel 27″, and you can understand how they fit the power supply inside the Mini. * The Mini’s 3/8″ woofer dome won’t be popping ear drums anytime soon. * Apple had to get creative with the antenna placement because they switched to unibody construction for this Mac Mini.